Paul McCartney shares the bizarre business idea he and Keith Richards came up with on holiday. Beatles Radio: The Beatles, Solos, Covers, Birthdays, News The Fab 4 and More! Paul McCartney has shared the bizarre business idea that he and Keith Richards came up with on holiday. 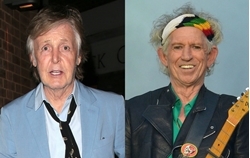 The Beatles and Stones musicians were both on vacation in Turks and Caicos recently, with McCartney saying he would visit Richards after lunch most days. Speaking to Marc Maron for the latest episode of his WTF podcast, McCartney revealed, while there, the pair had come up with an unusual business prospect. “[We were] designing portable dog kennels that were inflatable,” he said. “It was a pretty good idea, we thought.